During adolescence, identity and belonging are especially closely linked. How we see ourselves shapes, and is shaped by, whom we spend time with. These are normal aspects of human personality development and social life. As social groups form around shared interests or values, and cliques may result. A clique is a peer group of around two to twelve individuals who spend a lot of time together, sharing activities and confidences. Cliques form as young people imitate their peers’ speech, adopt their attitudes, and perhaps follow similar fads. They can be a way to maintain status or popularity. Joining such a group can be a positive part of a teenager’s search for stability and identity. Everyone has desires for familiarity, certainty, security, support, and a measure of control in our lives. Cliques, by definition, tend to exclude others, as members limit who is in and who is not. The experience of being left out is usually negative. “In-crowds” may employ flattery, humiliation, rumor, and worse to manipulate and control the emotional landscape. Fortunately, cliques typically don’t last; they occur mostly during the teen years. According to recent research by psychologists at the University of Illinois at Chicago, people recognize and sort others into stereotypical categories like cliques based on outward indicators, such as clothing, lingo, or hairstyles. Although we may see ourselves as not fitting any one particular group, we have a tendency to view others that way. Researchers have identified a dozen types of cliques among young people today: populars, jocks, floaters, good-ats, fine arts, brains, normals, druggie/stoners, emo/goths, anime/manga, loners, and racial/ethnic groups. If grouped as either “conventional” or “counterculture,” these cliques resemble those defined in previous studies. The five “conventional” groups—populars, jocks, good-ats, fine arts, and brains—are those “described as participating in school-sanctioned extracurricular activities, reflecting values and activities rewarded by schools.” The “counterculture” cliques—druggie/stoners and emo/goths—are made up of teens who generally don’t care about achievement and popularity. People have the capacity to belong to more than one group at a time, or to move in and out of different groups. In the researchers’ findings, students of color generally said that their identity, more so than white students, was closely tied to membership in a racial/ethnic group. The new findings also indicate that in the age of social media, cliques are more fluid, less sharply defined. According to the study, the importance of belonging has grown, as fear of “loners” being potential perpetrators of violence increasing. Meanwhile, education about topics such as bullying and mental health has contributed to trends toward greater openness and acceptance among many students. 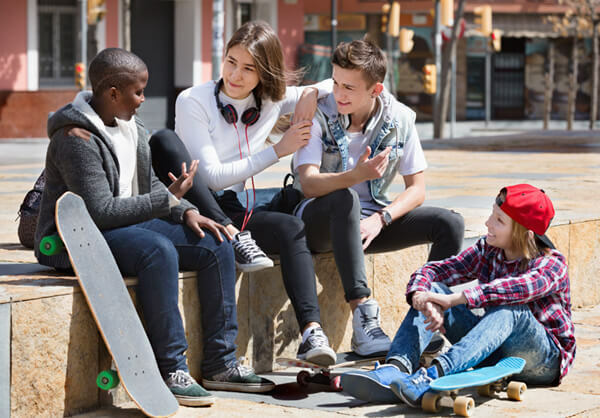 This article lays out the findings of new psychological research on teens’ experience of cliques. This website summarizes the University of Illinois at Chicago (UIC) study on cliques among high schoolers. This public health website contrasts true friendship with belonging to a clique, and presents coping strategies for dealing with the negative side of cliques. This article contrasts “clicks” with cliques in showing the positive and negative aspects of young people’s associations. This article breaks down the UIC study on modern-day cliques.